“It looked like it got hung up on some cables, and before you know it – boom! – it dropped, dropped to the street,” witness Brian Cruz told KOMO. (Reuters) – A news helicopter crashed and burst into flames in downtown Seattle on Tuesday, killing a pilot and a photographer on board and setting three cars on fire in a popular tourist area near the Space Needle, officials said. 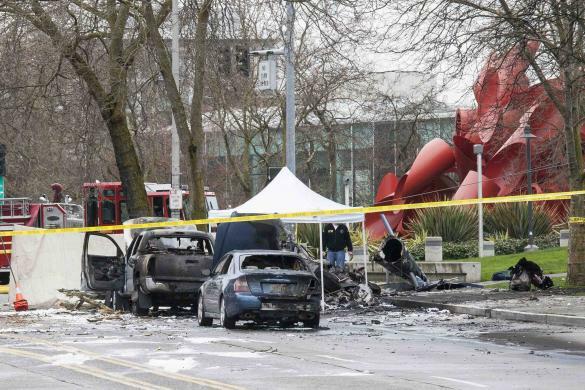 The crash, which left burning helicopter fuel streaming down the road and debris strewn on grass at the base of the Space Needle, occurred in a popular tourist area that also hosts a children’s museum and the Pacific Science Center. “At times like this we are reminded that the media, like many of us, are also public servants,” said Seattle Mayor Ed Murray, who visited Strothman’s adult children after their father’s death. “That person is hanging on to life,” he said.